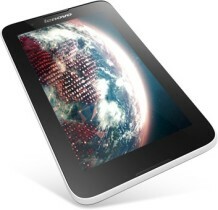 Indulge in mind-blowing technology and experience incredible power and speed with this Lenovo Tablet A7-30 that brings the world to your fingertips. Designed with a 7 inch capacitive display with a resolution of 1024 x 600 pixels, the A7-30 Tab provides a rich and vivid viewing experience both indoors as well as outdoors. The screen features a twisted nematic display technology for faster response while watching sports and playing games. Powered by a 1.3 GHz MTK 8382 Quad Core processor, the A7-30 provides efficient functioning while you multitask or play games. It operates on the Android 4.2 Jelly Bean platform for a fluid user interface and can be upgraded to Android Kitkat 4.4 as well. The device is integrated with a RAM of 1 GB to aid the performance. Capture all those special moments and video chat with your loved ones using this Lenovo Tab. 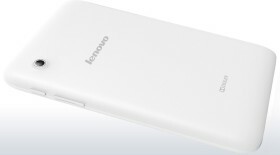 The device comes with a 2 megapixel primary camera and a 0.3 megapixel secondary camera. Take this Tab with you wherever you go; built with a 10mm slim profile and weighing just 327g, the A7-30 can be easily slid into your pocket. 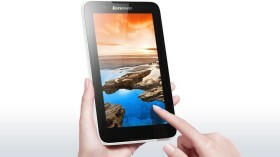 The device is easy to hold and operate making it convenient for you to watch videos and play games on the go. Experience a rich and immersive sound experience with the Lenovo Tab A7-30. Designed with dual front facing stereo speakers that are spaced well apart, the device provides enhanced stereo sound effects. The Tab is integrated with Dolby® audio enhancement for natural and distortion-free sound even while using headphones. The Lenovo Tab is built with an internal storage space of 8 GB which can be expanded to a maximum of 32 GB using a microSD card to store all your music, videos and pictures. The Lenovo Tab comes with 2G internet and voice calling facility that keeps you connected all along. Integrated with Wi-Fi and Wi-Fi Hotspot, you can browse the net effortlessly and connect other supported devices to access the internet. The device also comes with Bluetooth v4 for transferring data and a micro USB port for charging. Powered by a 3500 mAh Lithium Polymer battery, this Lenovo Tab can last up to 8 hours while browsing using the Wi-Fi on a single battery charge. It provides up to 336 hours of standby time. Navigating your way through a new place is no more a task since this Lenovo Tab comes with a built-in Assisted-GPS along with Google Maps. Only for Siliguri Within Certain Radius.